Last year, I stood on the largest ship I had ever been on. It was a giant metal behemoth, rising up out of the water with the height of a three-story building. The “Pacific Hope,” a YWAM ship, brings medical and disaster relief to ports around the world. It is 180 feet long (half the length of a football field), and weighs 480 tons: the equivalent of piling 70 adult male elephants on a scale and weighing them at the same time. How does something so massive, made out of metal, actually float?! More impressive than the outside, is the inside. Especially a room few visitors get to see: the engine room. This is a large room at the lowest part of the ship, full of massive pieces of steel machinery, cogs and valves, pistons and pumps. It is this room that carries the ship to safe harbor. This week, as my family is traveling the U.S. visiting our friends and supporters, I feel that I am getting a glimpse of the engine room of our mission. Today, I sat with three women who meet weekly to study the Bible and pray together in Joplin, Missouri. As I shared with them the testimonies of our past year in Mexico, I saw these women smile as they began to hear how God had used their prayers on our behalf. Every story of breakthrough, transformed life, or victory that took place last year had its beginnings in the “engine room” of prayer. After I had shared several inspiring testimonies from the past year, these three women took my hands and prayed with me. They prayed over my family, our YWAM base, and everything that God is using us to do in Mexico. I listened as one of our dear supporters, Patty, prayed. When she began to pray for our family, she listed off my children’s names as effortlessly as I do at home when I am calling them to dinner. That’s when I had a blinding realization: she speaks their names daily, as often as I do! These prayer warriors who have committed to pray for us really DO pray faithfully and regularly for us. They say our names throughout the day, each and every day. This entire first year as we have moved to Mexico and started a brand-new mission work in San Juan del Rio, I have been so aware of one constant: The FAVOR of God. It meets us everywhere we go! At exactly the right time, the apartment that we need will open up; we find a mechanic to work on our vehicle who does a repair that would have cost thousands of dollars in the U.S., and this Mexican, (who could see a “white person” as an opportunity to make extra money), does the repair without charging for his labor; we end up “accidentally” meeting the director of the government office, who makes phone calls on our behalf and cuts out hours of extra paper-work and hassle by personally seeing to our situation. Time and time again, this supernatural favor has met us, has overtaken us, has overwhelmed us! This is no accidental happening, no circumstance of chance. This God we serve is real, and He meets us EVERY DAY as we walk committed to obedience. Today, I realized this favor we walk in isn’t JUST because God is good. Which HE IS! But, this beautiful ship we are sailing is powered by a secret room: the engine room. The place where prayers are made and HEARD by Our Heavenly Father! This engine room is staffed by people the world over, people who forget about themselves and intercede on our behalf. This group of people is as diverse as it is committed: A woman on her knees at home, the carpet worn by her frequent visits; A young person, praying as he sees our photo on Instagram; church congregations, who join hands and lift us up, their hearts drawn by the Father’s heart for Mexico; Worship leaders, who sing over us as they pray; My mother-in-law, who refuses to take “no” for an answer, especially in prayer; People from other countries, who have never been to Mexico, but know that there are others out there who need Jesus; Widows who miss their husbands but pray for us, even as they walk through grief; Busy moms with homeschooling children bow their heads with their children in their “school-rooms” to remember us in prayer; Businessmen, pastors, lawyers, teachers, doctors, nurses, siblings, parents, grandmothers, children: this group of people who staff the engine room of prayer for us are many and varied. In an age where it can be so easy to get caught up in our own accomplishments, successes, hobbies, pastimes, comforts and joys, there are people who turn their backs on the moment and pray into eternity. If you are reading this, chances are, you have prayed for us at least once. You are a piece of this incredible operation that God has created. Yes, we are pushing into new waters. Each day, we feel new breezes and witness new things. But, we would be crippled if it weren’t for you. The people who toil faithfully in the deep, hidden places on this mission ship are vital to us. Those who put in the time, in the dark, never to see what we get to see, but committed to the journey nonetheless. You are part of that group. Never believe that what you do is insignificant. Your prayers keep us alive, they keep us moving, they keep us focused. Your prayers make miracles happen every single day. Did you know that in the last year since we moved to Mexico, our children have not been sick? We haven’t had to take them to the doctor for a stomach illness, cold, infection, broken bone, ANYTHING. We have five kids! And they are living under the protection and covering of an engine room of prayers. So, I’d like to dedicate this blog to you. The hidden ones in the engine room of this ship. Prayer warriors. Mothers and fathers for the next generation. You are not satisfied with the comfort and ease of everyday life. You are always looking for more. And you bring us along with you. How can I thank you? You know my children’s names as well as your own…. And now I believe it. It’s just not a nice thing to say that you forget as soon as we leave. A year ago today we arrived with our five children, seven large suitcases, and seven carry-ons to the nation of Panama. In my rush to pack and have everything ready for our new life in Panama, I had brushed aside a brief comment in an email from the YWAM base. They had written, telling me, “We have rented a local Panamanian home for your family. But, it is VERY simple.” Being an “experienced missionary,” I allowed myself to feel no concern. I have lived in simple housing before, and it’s no big deal. “As long as there is a place for us to sleep, and an indoor toilet with running water, I can do anything,” I assured myself as I mentally dismissed the kind letter from Panama. I’ve spent weeks sleeping on an air mattress on the floor, and taking bucket baths. This ain’t no hill to climb. This was a defining moment for me. I had been told I would go through a “fantasy period” in missions, akin to the honeymoon for newlyweds. This fantasy period lasted a brief 4 seconds. It melted into thin air as I gazed at the place we would be living. Looking back now, it seems so dramatic. The house really wasn’t that bad. It certainly wasn’t a grass hut with mud floors. I don’t know what made that moment so hard for us, other than it was just completely foreign to us, and stark, and lonely. An ache rose in my chest as I realized that I had packed up my small children and brought them to this. No friends, no grandparents, and a house that seemed to reject us from the moment we arrived. A brief tour revealed a simple block-structured house, with a concrete floor and a tin roof; a white drop-down ceiling had just been installed before we arrived. The walls appeared dirty, and when I tried to rub them clean, I realized they were discolored from the people who had lived here prior to us. Up until this point, whenever we had moved into a house, I had always had a slight consciousness that people had lived there before us. But, this house felt like SOMEONE ELSE’S house that we had invaded. Dirty walls and all. The house measures 550 square feet. and divides into 6 rooms: 3 small bedrooms, a room that holds the 8-foot table and chairs, the kitchen, and a bathroom. Each room had a single, lonely lightbulb bravely trying to dispel the feeling of gloom and neglect. The boys’ room was the starkest. The prior family had apparently run out of paint, and so left half the room unfinished. Part of the room was white-washed and the other half of the room was unfriendly concrete block walls. Paired with metal bunkbeds, it strongly resembled a prison cell. The other challenge was that Panamanians don’t worry much about storage. So, this house literally had NO shelves, closets, or anywhere to put things. It also didn’t have any mirrrors, towel hooks, toilet paper holders, etc. My “so what” attitude before coming slammed me in the face as I realized I had been completely unprepared for this. I went into my 12-year-old son’s room and found him silently crying. “I really miss Joplin, mom,” was all I could get him to tell me. As much as we didn’t want to be there, we had to be there. So, I began to throw a little Pollyanna at the thing. We began to count our blessings. We had received a nice welcome basket from the YWAM base, with cookies and candies and drinks. It was later, as I went to pick up a bag of chips that I discovered the 5 cockroaches milling about in the basket that the held the goodies. I felt I handled it pretty well until a cockroach ran up my arm and tried to enter my shirt. I decided to scream then. But, that’s a story for another blog. Back to the “glad game:” I rejoiced that we had our own refrigerator! This was a precious item, because we hadn’t had one at the other YWAM base in Mexico. I made a mental note to buy ice trays. We would have ICE to cool our drinks! We also had been given a two-burner gas stove top and a tank of gas. We didn’t know how to assemble it, but figured, “How hard could it be?? ?” After ten more cockroaches (lurking in the box that held the gas burner stovetop), holding our tongues just right, and a lot of trial and error, we assembled our very own gas stovetop! I didn’t have any food to cook on it, but was determined to remedy that quickly. We sent our somber boys to the neighborhood “tienda,” (little shop that carries snack foods and some basic grocery items) and they came back with glass bottles of pop and big smiles. They’d had their first adventure in Panama, and that was a happy beginning for them. We didn’t have a vehicle, and a missionary named “Ezra” offered to take us shopping in David (a city) the next day. What Ezra and his wife did for us that day will never be forgotten. They had us over for lunch, and while she watched 8 children, he took us shopping. That meant he literally spent the next 4 hours standing in stores, waiting, while I scoured aisle after aisle, trying to learn what items can be bought in David, Panama. This is a learning curve that missionaries don’t tell you about when they are sharing their stories of adventure and incredible testimonies. For about 2 months, they are new-born babies in an strange, new world. They are surrounded by people who don’t know them, don’t understand their culture, and don’t really care if they “make it” in this new country. These missionaries don’t know where to buy dental floss, a bottle of Tylenol, or yogurt. They don’t know where to find the hardware store, the post office, or the supermarket. They don’t know the best place to buy vegetables or meat. They don’t know if they can even find all the necessary ingredients to make their favorite recipes. All of the convenience of knowing where to go that we take for granted as adults is stripped away when you move to a new country. As a result, shopping trips tend to last for hours, especially in the first couple of months in a new location. Every time I apologized to Ezra for shopping too long, he said, “It’s o.k., we had to do the same thing when we got here. Take all the time you need.” So, though we were in a strange country with no family or close friends, we found ourselves belonging to a brotherhood of others who understood what it meant to be displaced. The shopping trip that day was epic. I bought enough plastic storage tubs to fill the back of the fifteen-passenger van we were driving. I bought storage hooks, wood planks to make shelving, mirrors, trashcans, COCKROACH-proof containers for storing food, and PAINT. We spent the next two weekends painting, installing shelves, borrowing tools, asking questions, asking questions, and asking questions. We learned that in order to hang a curtain rod, you needed a hammer drill that would pre-drill four holes, then you had to sink a wall anchor in the holes, and then you had to drill screws into the bracket to hold the curtain rods. Nothing in Panama can be done quickly. After a week of cold showers, a missionary friend explained how our shower water heater worked, and we began taking warm showers! We also began to meet our neighbors. They learned to stop by when we were cooking meals, and enjoyed sampling our strange, “gringo” food. Our trees in the yard yielded fresh bananas, guava fruit, and oranges. We didn’t have a car of our own, so as we walked several miles a day to/from the base, we would tell stories and jokes and talk about the Lord. And I made a beautiful discovery: I found that His Word is always true. “I can do ALL THINGS through Christ who gives me strength.” (Philippians 4:13) “My grace is sufficient for you; for MY STRENGTH is made perfect in weakness…” (2 Cor. 12:9) I learned to take my weakness, my disappointment, and my impossible situation and surrender it into His capable hands. He, in turn, gave my entire family a supernatural grace to not only live here, but to THRIVE here. Painting the boys’ room. I have a great helper! 1. Dry shampoo is a girl’s best friend! 2. The “hervidor” and large bucket are key to luxury bathing. First, I must explain the hervidor. (Spanish for “the boiler.”) It is a carafe that holds about a liter of water and can boil it in two minutes. No lie. It is the most amazing contraption for heating water. It sits on a hot plate that plugs into a wall outlet. When someone first told me to heat water in it, I expected it to boil in about 20 minutes. But, South America has a special feature: 220 volt outlets! Double the power we use in North and Central America. The water goes from room temp to boiling in 2 minutes! I have coupled the quick-heating feature of the “hervidor” with a two foot diameter plastic bucket in order to defy the phenomenon of the cold shower! My perfected recipe: 4 liters of boiling water. This is done in increments of a liter at a time that takes 2-3 minutes to heat each batch. I pour the boiling water into a cooking pot, hoping it helps retain the heat. Once my 4 liters are heated, I carefully mix the heated water with room temp water, getting it to the correct temp in the white bucket. Then, with a small plastic bucket, scoop the water over my head and enjoy a deliciously hot “shower.” If you are ever in South America, I hope you don’t miss the opportunity to see an hervidor in action! (Question to those reading from Europe: do you have these there? What do you call them???) 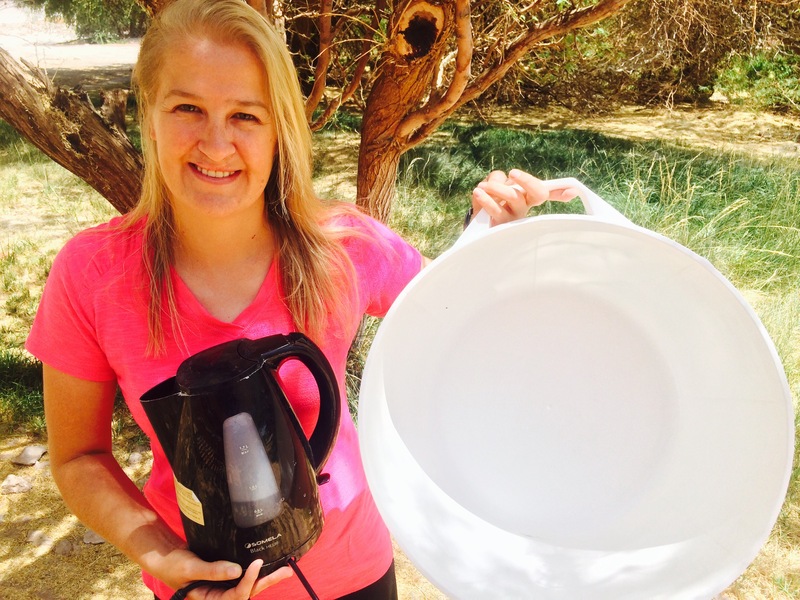 Even if you aren’t heating water for bathing, you can have a hot cup of tea ready to drink in 2 minutes. Sorry I’m sounding like a product tester, it’s obvious I’m in love. The sad part is, they won’t work in 110 v outlets. The time will come when I will have to say goodbye. The perfect combo: an hervidor with a bucket. Result: hot showers. This Momma is happy! 3. Moisturize, moisturize, moisturize. Everything. Literally. 4. Never underestimate the power of menthol. Let me share this dislaimer: I come from the generation whose grandmothers used Vicks Vaporub to cure all things. A dab of menthol could chase away a cold, the pain of sore muscles, AND your love life. One whiff of that stuff and you were destined to spend the night alone. So, this bit of advice comes from a life-long skeptic. I have laughed at my grandmother’s obsession with menthol for 30 plus years. But, as my nose began to dry in the desert climate, I began suffering from repeat nose bleeds. The air whistled through my nose, and it was actually painful. One of my DTS students convinced me she held the cure: Menthol ointment. You just rub a finger-full in each nostril, and your dry nose symptoms were over. I have to say, it worked. Besides feeling like a huge dork putting menthol in my nose, my eyes watering over the smell, the magical effects were wrought: my nose instantly began to run. No more dry nose. The somewhat undesirable side-effect was the ol’ love life clause. Rob refused to kiss me. I can’t say I blamed him. 5. Spritz your water with lemon. Here, the water is extremely alkaline. The desert here is salty. You can pick up a shiny chunk of rock and lick it, and it will taste like salt! As a result, the water tastes really strange. Kind of like there is a dry powder in it. We have learned to squeeze lemon into it. It sweetens the water. If you can, chill the water overnight. You will have a cool, refreshing treat! 6. Don’t forget your sunscreen, sunglasses, and wide-brimmed jungle hat (for Joey.) EVER. We walk about 7 minutes across the desert to go to the lunch room. The sun at high noon is blistering! So, we prep the kids like they are spending a day at the beach for a ten minute walk to go eat lunch. The extraordinary thing is, the temps can be 90-100 degrees in the sun, and in the shade, a comfortable 70 degrees! 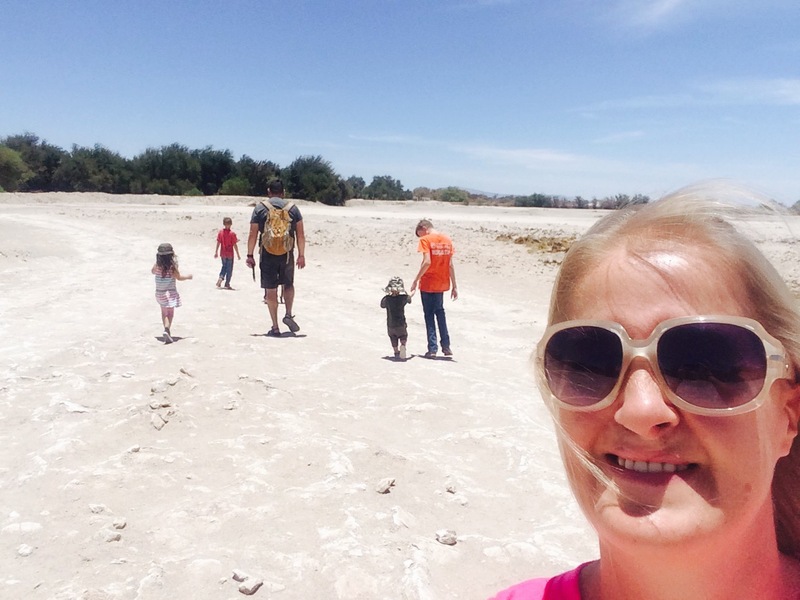 My family walks through the desert landscape to go eat lunch! This is a hike we make at least four times daily. 7. Dry your hair, unplugged. The ability to dry here is amazing. Our clothes dry on the clothesline in 30 minutes. If you don’t take them off the line by 1 hour, they will start to fade from the sun. My hair dries in 20 minutes. 10-15 minutes, if sitting in full sun. When mopping, the floor you have started to mop will be dry before you are finished mopping the entire room! I have discovered the dumbest thing I packed for this trip was my hair-dryer. 8. My final beauty tip is to smile and laugh a lot! This list of beauty tips is NOT comprehensive. I welcome comments and tips from others to add to my repertoire! In conclusion, for all those ladies out there who will see me in December sporting a sweet tan and solar highlights, don’t be jealous. If you get too close to me, you might catch a whiff of menthol. That should be enough to convince you that nothing about this girl is even remotely glamorous.